We don’t have any evidence about how or when George Washington learned to dance, but it probably wasn’t from a book. His formal education, provided to him as one of ten children of an aristocratic Virginia family, ended in his early teens. The dances of 18th century ballrooms, the minuet, the reel, the jig, the cotillion and the country dance all required skill, grace, rhythm and balance. Washington loved music but was not a musician. Even so, while in Philadelphia, he held his own in company with polished dancers, all the while under the scrutiny of the highly critical public. He must have had instruction somewhere, especially to execute the complicated rhythms, patterns and steps of the minuet. Mr James Robardet, who has taught my two Grand children dancing, proposes going into your part of the Country to establish a School, if he should meet with sufficient encouragement, and has requested that I would give him a line of recommendation to some of my friends. Mr Robardet’s attention to my grand children, and the progress which they have made under his instruction, induce me to recommend him on these accounts from my own knowledge: He has likewise kept a dancing School in this City the winter past—in which I am informed he has given much satisfaction, and his conduct has been marked with decency & propriety, so far as I have heard. The minuet was to 18th century ballrooms what the waltz would be in the 19th century, the enduring grande dame of dances. The dance steps and musical form of the minuet had originated in France in the 1660s. Under the watchful eye of Louis XIV, France had come to dominate European–and therefore American–fashions in clothing, food, art, music and dance and it would maintain that cultural dominance for several hundred years. 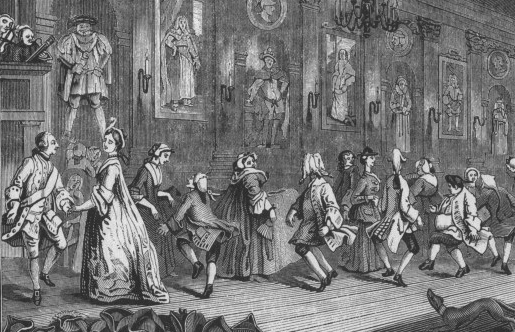 The 18th century ballroom minuet began every formal ball. 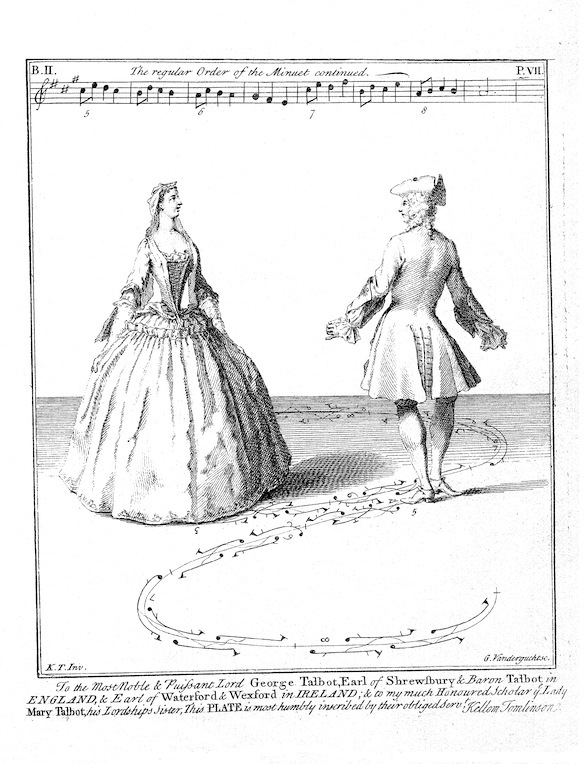 18th century dance manuals give detailed descriptions of the form and steps of the minuet. More “Dancing With the Stars” than leisure activity, it was performed by one couple at a time while the rest of the assembly looked on. The highest ranking or most honored couple would lead off the first one. In keeping with its highly ceremonial quality, the minuet began and ended with formal bows and curtsies called “honors” to partner and to the company. 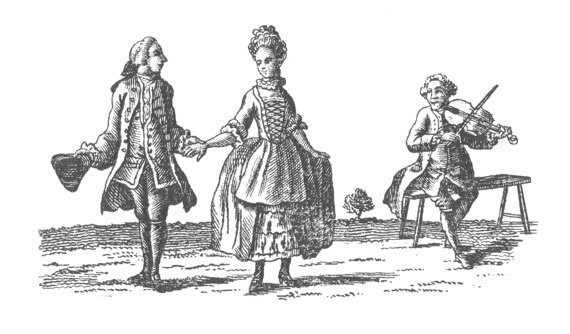 (See illustration, right, from Kellom Thomlinson’s Art of Dancing, London, 1735.) 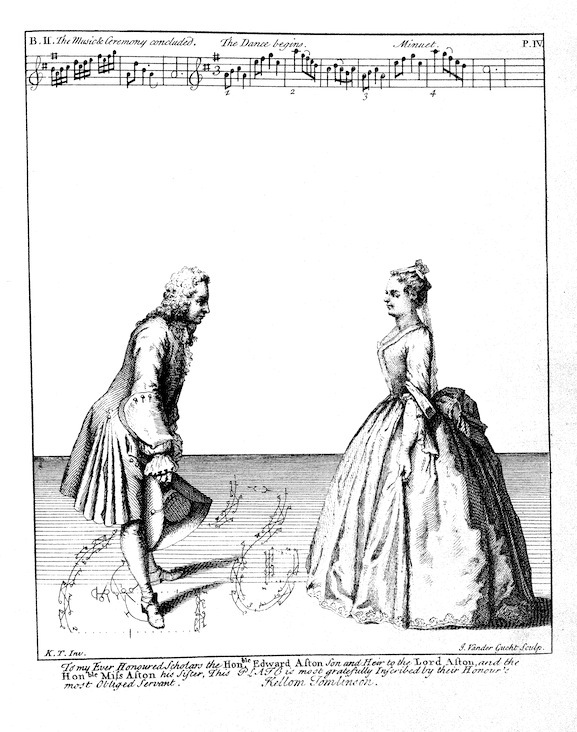 The unique quality of the minuet was that unlike other choreographed ballroom dances of the time, where certain steps went to certain parts of the music, it allowed for improvisation and spontaneity within a framework. There were sections that had to be performed, alternating with “S” patterns, where the couple exchanged places, that could be repeated at will. (See the illustration from Thomlinson below, left.) There was a step vocabulary particular to the minuet, but the steps chosen and the number of steps used to complete each figure could vary. Good dancers were also encouraged to make figures NOT fit perfectly with the eight bar sections of the music. The dance demanded focus, control and spatial awareness of both the partner and the onlookers, all to achieve an air of unaffected ease and nonchalance. The dancers approached and withdrew from each other in a display of courtship, grace, skill and power. The level of skill necessary to carry all this off was akin to the training and technique a competent tango dancer needs today. These technically challenging, presentational, single couple minuets would usually go on for the first few hours of the evening before giving way to the popular, more relaxed cotillions and country dances. Much more democratic than the minuet, the country dances were done by couples in long parallel lines, men on one side, women on the other. In the course of the dance each couple proceeds up and down the rows to dance figures with all the other couples. (See the illustration, above, from Hogarth’s 1753 Analysis of Beauty.) Each “set” could contain up to ten couples, and large ballrooms could hold several sets of dancers, so the entire assembly could dance at once. The rows of dancers that country dances required help explain the long, narrow shape of the 18th century Philadelphia rooms that were used for dancing, such as the ballroom in the City Tavern and the upper floor of Independence Hall. Most of the figures of the 18th century English country dance were used the cotillion, a country dance variation where four couples faced each other in a square, rather than in long rows. Cotillions developed into quadrilles in the 19th century and eventually into western square dances. The steps and figures of country dancing, like allemande, casting off, changing places, ladies change and hands across are all familiar to modern recreational dancers who do square dancing or English country dancing. Its minimal skill requirement and sociability have served country dancing well; new dances. tunes and figures are still being created today in the tradition of 18th century English country dance. The minuet hasn’t fared so well. By the time Washington was leading off the first dance at the Philadelphia Dancing Assembly, the minuet was already well over a hundred years old. Dances, like people, tend to slow down and become more sober as they age. By the 1810s, the minuet was a stodgy ballroom relic, used for only the most formal occasions. The minuet faded from national memory until 1876, the great Centennial of American Independence. When the dance was reconstructed for centennial celebrations, it became what 19th century Philadelphians wanted, a nostalgic symbol of a nobler, idealized era. Victorian reconstructions of the “stately” minuet featured much fussy bowing and scraping, fingertip hand holds and mincing, daintily pointed feet – all of which would have been alien to the 18th century aesthetic. 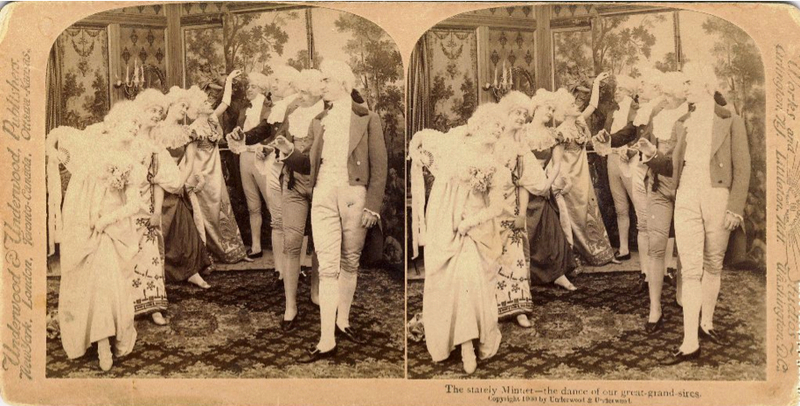 (See the illustration, above, right, “The Stately Minuet – the dance of our great-grand-sires,” from a 1900 stereopticon slide.) That precious, mincing minuet style reared its badly-wigged head again for the Sesquicentennial in 1926, where colonial dames appeared in white cotton wigs and ’20s-style dropped waist “revolutionary war-era” gowns. It was this theatricalized style of minuet, filtered through the prism of Victorian romanticism, that has appeared in dozens of Hollywood movies from the 1910s right up to the present. Dancing, like history, tends to be what each generation needs it to be. ● The inexpensive 1984 Dance Books Ltd. reprint of John Playford’s 1651 The English Dancing Master seems to be out of print, but there is an online facsimile of it here. ● Lastly, all of Kellom Thomlinson’s 1735 Art of Dancing is available on the Library of Congress wonderful “American Memory” website here. Oh, and a happy Presidents’ Day 2012 to all! Olá, Ana! Talvez, sim. Provavelmente com um professor, também.